We are now working on one Juno-60 with Tubbutec MIDI and reservations are welcome. 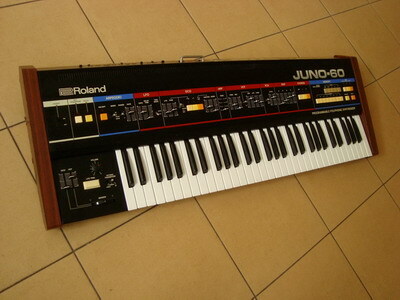 Roland Juno-60 and 6 (they are the same internally minus memory locations) are unbelievably lush sounding instrument. Besides, they are a fruit of Roland’s extremely smart engineering – they are very easy to program and the entire panel is very sensibly laid out. It just welcomes you to program this inspiring machine. It’s quite hard to imagine that it took the 60/6 long years before achieving that status it has nowadays. Tubbutec upgrade really brings out a true monster in the Ju-6/60. It allows for flexible MIDI control and has a numner of very smart performer’s functions. Q: Is the Juno-6 better than the Juno-106? A: Only if apples are better than oranges. Even though they look more or less the same (functionality-wise), they are very different internally, which results in a completely different sound. It can be said (but it’s only an estimate) that the 106 is more of an 80s sounding, funky machine, while the 6/60 have the 70s brassy, string-ey vibe. If only you can, test both before making a decision. Q: Do the 6 / 60 suffer from the same voice problem as the Juno-106? A: No, they don’t. They are build around different ICs and thise issue does not apply here. Bass and drums are EMS Synthi, all else is unprocessed Juno 6/60 with Tubbutec. Powerarp playing polychord with some extra delay added. Powerarp playing polychord with oscillator detuning and sample and hold.